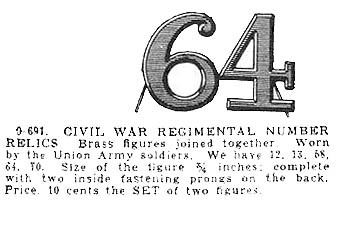 Brass regimental numbers were worn on the front of the Jeff Davis hat or the front or top of the kepi (forage cap). They were five-eighths of an inch in height by regulation and would fit within the circle formed by the tube of the infantry horn. Numbers can also be found that were one inch in height. The regulations only mention company letters worn on the front of the forage cap. In practice soldiers wore various insignia on their forage caps including the branch of service insignia intended for the hat, regimental numbers, company letters, letters indicating their state or regimental nickname and corps badges. 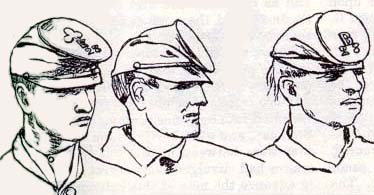 In some cases the forage caps were devoid of insignia. The two letter are soldered together and wire prongs were soldered to the backs of the numbers to attach them to the hat. The insignia pictured above were part of the Bannerman's lot. Bannerman bought up large amounts of surplus items from the U.S. government and sold them via a catalog and from its New York store. By the 1960s Bannerman's business had declined.